Scuba diving on a BUDGET in the Maldives. Now that's a sentence we didn't think we would hear. But, it's true! 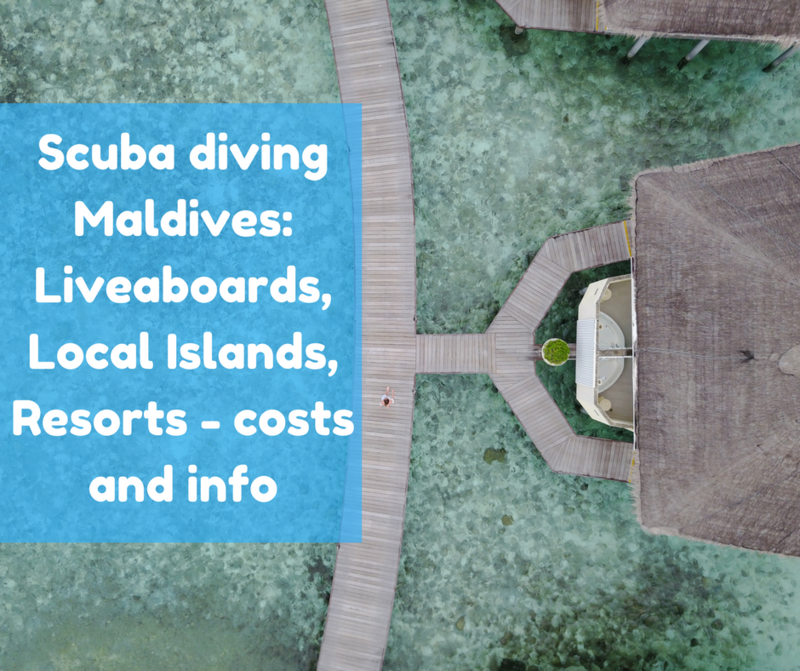 Girls that Scuba recently went to find out themselves and stumbled across the hidden gem of the Maldives; local islands - where you don't have to be a millionaire to scuba dive in one of the world's top dive destinations. You're going to want to read this one carefully! So what are local islands exactly? They are inhabited islands where the locals live, the population of these islands was counted to be around 500 – 2500. The length of the islands varies from 500m to 2,000m, and the width is practically equal to the length. There are about 200 inhabited islands in Maldives. The opportunities for tourists to stay are available only on 100 of them, and about 30 of them provide the tourists with well-developed infrastructure, including ferry terminal, guest houses, cafes and restaurants, beaches, and diving centres. Direct scheduled transfers available from: Male, (ferry and speedboat) Maafushi (ferry), all islands in Vaavu Atoll (ferry and speedboat). Dress code: Very relaxed, but both men and women should cover up when away from the bikini beach, where swimwear is totally fine. You’ll need one pair of flip flops – and even then, maybe not! You’ll find: a health centre, a school, community centre, mosque, shops, cafes, guesthouses. And of course Fulidhoo Dive the dive centre we shared an awesome 5 days with - more about them later! 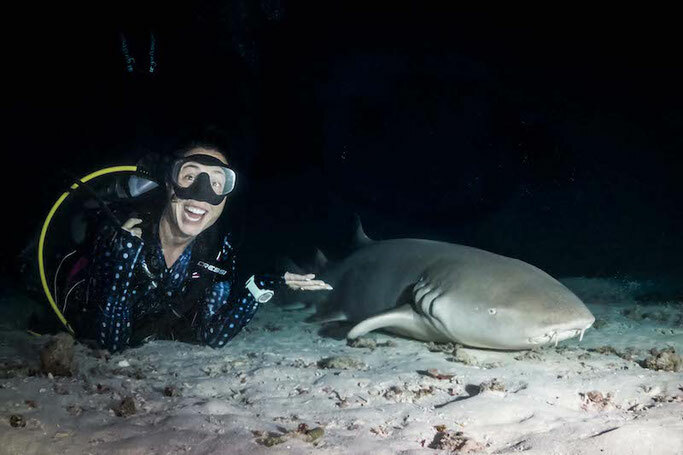 Fancy sleeping with nurse sharks? Ok, this is the reason you are here; to find out if the scuba diving is any good in Fulidhoo! Maldives is one of the best destinations in the world to scuba dive! 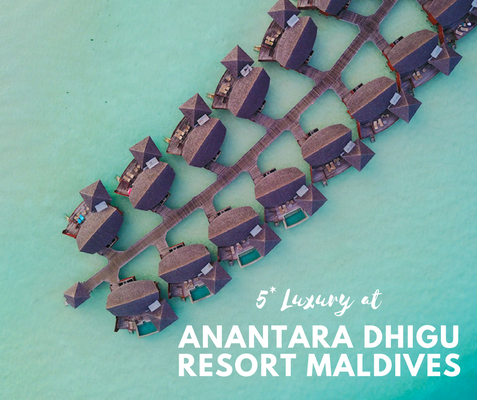 The great thing about Maldives is it is full of islands, sand banks and channels, which means which ever island you decided to go to you are going to see a lot of the same stuff. Famous for manta rays, whale sharks and dolphins, there are of course certain Atols/islands you can visit to assure more sightings and Fulidhoo is one of them. Huge amounts of nurse sharks, grey reefs, white tips, schooling fish such as barracuda and trevallies, Napoleon wrasse, giant clams, colourful soft coral, turtles, schools of eagle rays, sting rays, manta rays. Great channels, great fish and pelagic life, remote island feel, quiet dive sites. The high season of December to April is the best time to visit, with great viz, good currents and dry weather. But during low season there can be weeks of dry weather, and because you can reach both the east and west of the atoll from Fulidhoo – depending on the wind, they can generally always find sites with good viz. Low season is a great option as room rates are cheaper and the island is very quiet. Fulidhoo Dive a PADI 5* Dive Centre, Maldivian and British owned by Ali Miuraj & GTS girl Adele Verdier-Ali. We dived with them for 5 days in November 2017 and had an amazing time! We saw sharks on EVERY DIVE, manta rays, turtles, dolphins, rays, and huge schools of fish. Compared to diving within resorts we much preferred the local experience and the untouched reefs! Adele is a member of Girls that Scuba and has a huge passion for sharing the Maldives and its diving with others. Her husband Ali, is just about the loveliest man on earth and is full of knowledge, humour and kindness. Fulidhoo Dive is the only dive centre on Fulidhoo and they deserve all the praise they can get! We can not recommend them enough and give you a guarantee you will have a great time diving with them - send us selfies with Adele and Ali please! Schedule: From Male to Fulidhoo (stopping in Maafushi along the way): Sunday, Tuesday and Thursday at 10am from Vilingili Terminal in the west of Male. The journey will take 3.5 hours and costs 3.5usd. Tickets go on sale from 3pm the day before. There is the possibility that they can run out during high season, so if you can’t get there the day before, get there at least by 9am. The terminal is very basic, with a public toilet, but no AC. There is a café opposite though called SeaHouse Brasserie, which has AC, wifi and good food and coffee, but expect European prices. From Fulidhoo to Male: 11am on Mondays, Wednesdays and Saturdays, also stopping in Maafushi. 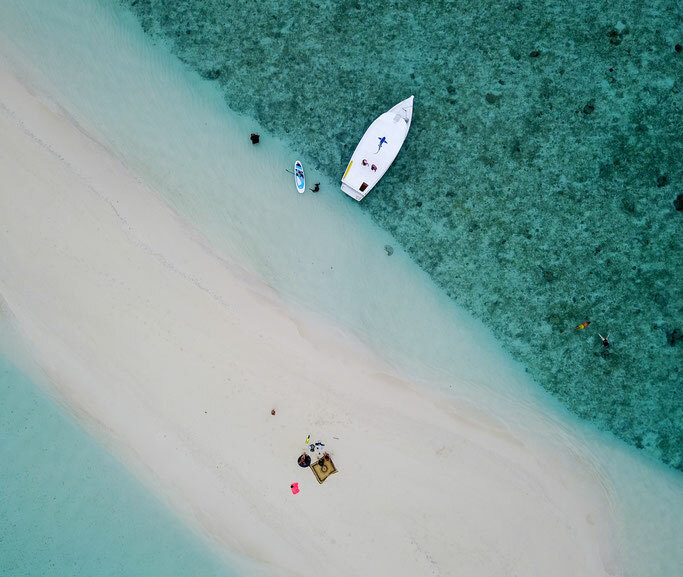 There are scheduled speedboats every day except Friday to Fulidhoo, normally at 11am but you’ll have to contact your guesthouse to book you a seat and to confirm the time, as they are subject to change. These leave from Male, normally from the jetty called Muizzu Neru, near Mary Brown Restaurant. This will cost you 40-50usd per person each way and take 1hour 15 mins. Also – Kinan Retreat, a guesthouse on the island, owns their own speedboat and may be able to arrange collection from the airport if you are staying with them. 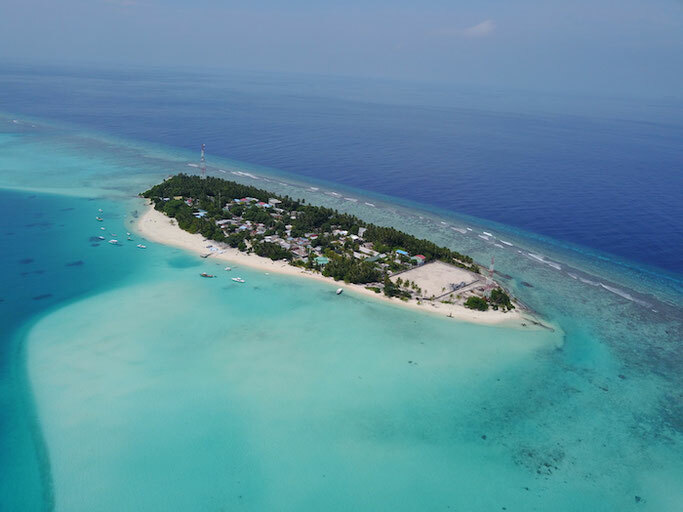 There are 9 guesthouses on Fulidhoo on booking.com, ranging from £20GBP - £80 per night. Yup, it's cheap to stay on this Maldivan paradise. We stayed at Kinan Hotel (approx £50 a night) which was very clean and spacious - and even better than some of the budget resort rooms we'd stayed in previously. The food there isn't so good though so we'd recommend you heading out to one of the local cafes and restaurants and experience local made, yummy, food! You have to book before you go, so book now. Locals tend to be shy, but if you approach them first, they will be very welcoming. Just give people a smile and wave! Locals will also be more open if you respect the island’s dress code. During Ramadan, the holy month of fasting, all cafes will be closed during daylight hours although you can still order food from your guesthouse. There IS NO ATM on Fulidhoo - take money out before you come. You also cannot pay on card in guesthouses. (Fulidhdoo dive have a card machine to pay for diving). 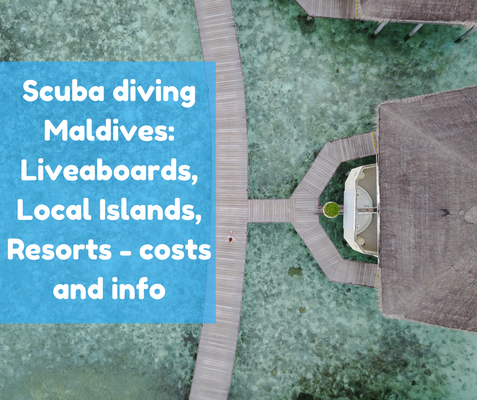 The ultimate guide to budget diving in Maldives and Fulihdoo island - share with someone that would love this!